Sunset Garbage Collection can offer your business or organization a garbage and recycling plan that fulfills your particular needs. Whether you run a small or large business, we can develop an efficient, affordable waste and recycling plan that conforms to your needs and budget. If you are looking to decrease the quantity of waste that your company produces, our current recycling programs may be able to assist you in this regard, helping you to control your garbage and recycling costs. For more information about our rates, invoicing, pickup and services, feel free	to call our customer service representatives at (503) 774-4122. We are prepared to serve you promptly and effectively. 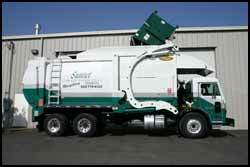 Sunset can supply everything you need for waste and recycling. Sunset Garbage Collection has a large variety of bins, carts, containers and drop boxes to assist you in your individual requirements. We possess everything you require to manage your waste and recycling needs, whether it	be small desk-side bins for offices or huge containers for construction, demolition or renovation undertakings. Moreover, we can enlarge or reduce the size of your containers as well as modify the pickup schedule, should your needs change. For more information	about utilizing these large containers, please see the Drop Box and Containers page.